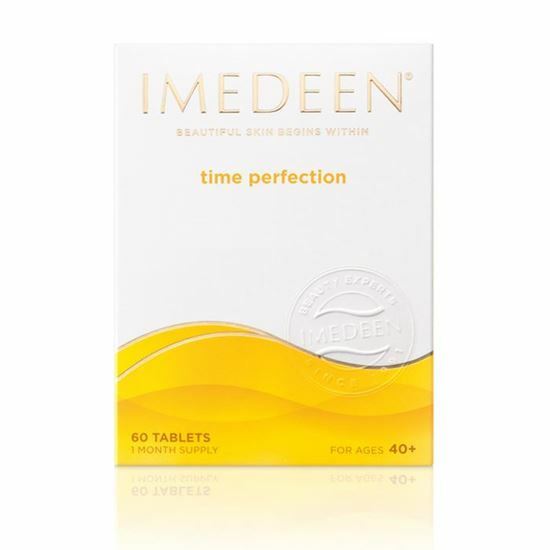 IMEDEEN Time Perfection skincare tablets help combat visible signs of ageing. Works in the deep dermal layer where traditional Anti-Ageing creams can’t reach. The tablets work in the deep dermal layer where traditional Anti-Ageing creams can’t reach. Featuring the exclusive Marine Complex – rich in proteins and polysaccharides similar to those found naturally in the skin’s supporting tissue– and LycoPhenceGS® Forte- a patented skin defence system containing lycopene (derived from non-GM tomatoes), grape seed extract, vitamin C and zinc. The recommended daily dose is two tablets. Allow time for Imedeen tablets to work. Results can be noticed after 2 - 3 months. Please read the product packaging before use. Vitamins and supplements are not intended to treat or prevent any disease. Imedeen Time Perfection has recently been enhanced with NEW Lycophence GS Forte – a more powerful mineral enriched anti-oxidant complex that starts working within 24 hours to help protect skin against oxidative stress caused through environment and lifestyle. In addition to the original free radical scavenging formula of lycopene and grape seed extract, LycoPhence GS Forte now provides skin with 90% RDA of Vitamin C and 27% RDA of zinc – essential for skin integrity and healthy skin renewal. Vitamin C is essential for the production of collagen.